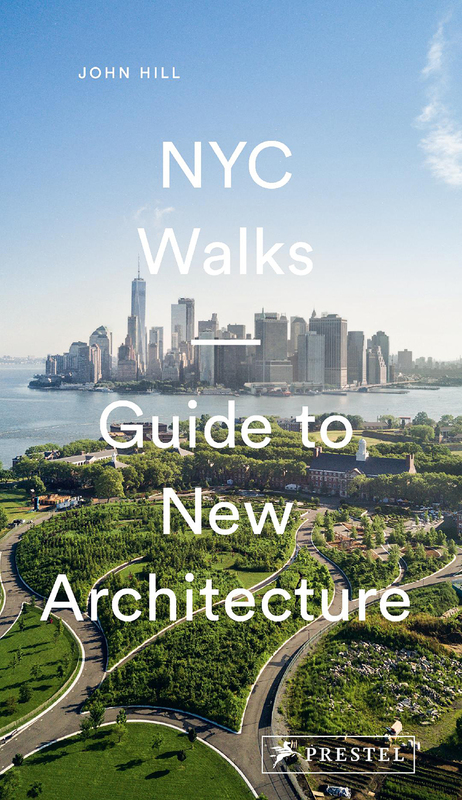 A Daily Dose of Architecture Books: NYC Walks – Out Today! NYC Walks – Out Today! It can be hard to keep up with New York City’s surge of cutting-edge architecture since the turn of the millennium. 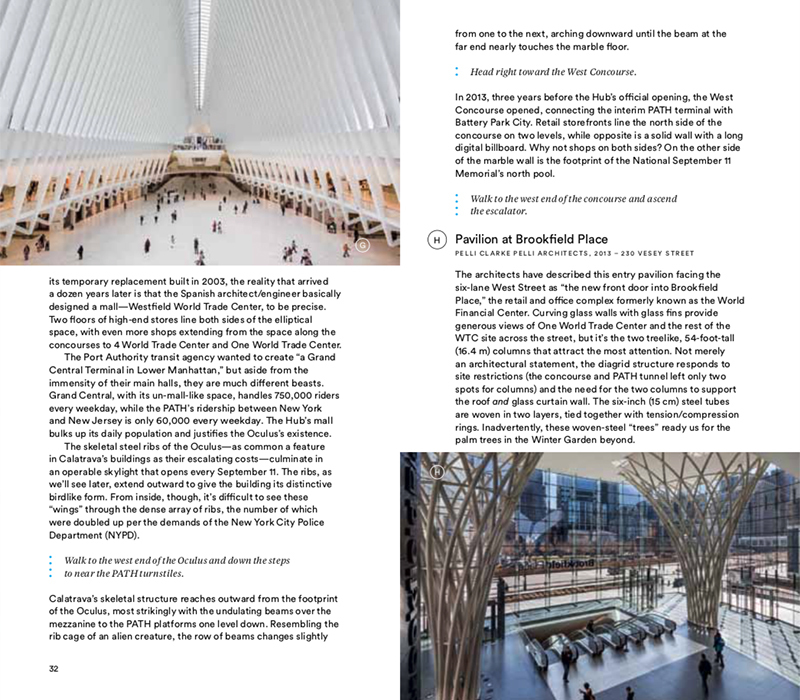 This portable, easy-to-use guide directs readers to the city’s newest architectural gems, all completed in the 21st century with some still under construction. 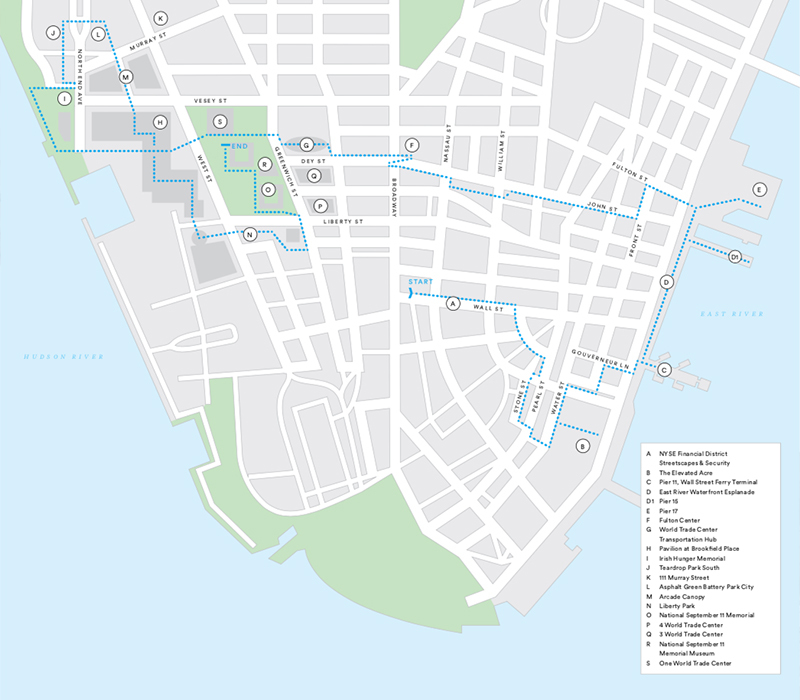 Divided into ten 1- to 3-mile walks that extend from Columbia University through lower Manhattan and across to Brooklyn and Queens, this guidebook highlights over 150 buildings, popular destinations like the High Line and Lincoln Center, and trendy locations such as Boerum Hill and the Bowery. Led by author John Hill, these tours are highly informative, engaging, and filled with fascinating insights and details. Maps and numerous photographs make this guide the perfect companion for anyone visiting New York City, architecture buffs, and those wishing to better know the city they call home. I wrote this book, so instead of my usual commentary in the form of a review I'll give some background on the book and explain what I hoped to accomplish with it. 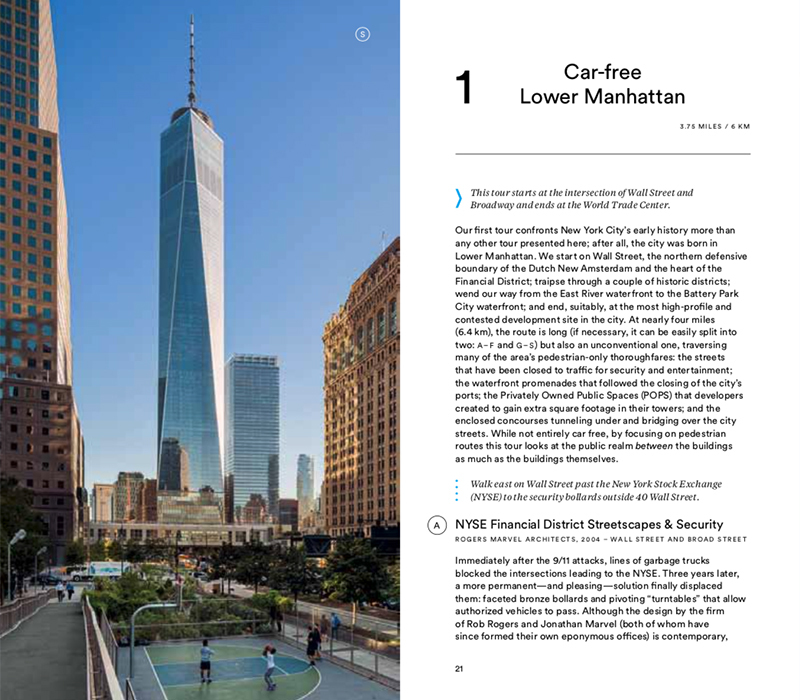 NYC Walks presents ten architectural walking tours I've been giving since the release of my first book, Guide to Contemporary New York City Architecture. That book came out at the end of 2011 and in early 2012 I was invited to give some tours at Van Alen Books. Those tours started at the since-shuttered store on West 22nd Street and headed to the High Line (then just two of its three phases were open) and other nearby areas. I'll admit I never anticipated giving walking tours when I was writing that book, but I really liked designing the tours -- figuring out their routes, the buildings and landscapes to look at, and what to say about them -- and grew to like giving them (like most modern-day humans I wasn't so big on public speaking at the time); I also think walking is one of the best ways to see a city. Following the tours with Van Alen Books, I started giving tours with 92Y Tribeca, which at first were limited to below 34th Street; but they didn't require starting at their location on Hudson Street so I had more freedom for tour routing. In addition to the High Line tour I developed tours on the Bowery, in Lower Manhattan, and in Brooklyn. In 2013 the 92Y Tribeca shuttered (I'm sensing a pattern) so started giving tours with the 92nd Y's main Upper East Side location; this allowed me to design tours in Midtown and above, including Queens, the borough I call home. Over those six years, from early 2012 until I handed in the manuscript for NYC Walks in early 2018, I developed more than a dozen tours and selected eight of them for the book; I developed two new tours for the book but in the meantime have given them to patrons of the 92nd Y and other institutions I offer the tours through. When I pitched the idea for a book of my architectural walking tours to Prestel, my intentions were twofold: write a book for which nearly all of the research was already done (my two other books with Prestel involved a good deal of research taking place over a short amount of time) and do an update of sorts to my 2011 guidebook. The ten tours I selected trace parts of the city with a density of new architecture, including many notable buildings completed since 2012. My Guide to Contemporary New York City Architecture was written in 2009/2010, a downtime for myself and most in the architecture field. But in the ensuing years the pre-2008 building boom resumed, especially in residential buildings, educational facilities, and in parts of the city rezoned by the Bloomberg administration. If Guide takes stock of the first two terms of Bloomberg's three-term tenure, NYC Walks looks at the lasting impact of the administration's initiatives, be it mega-projects such as Hudson Yards, Columbia's Manhattanville campus, and Brooklyn's Atlantic Yards (now Pacific Park) or the fine-grained efforts of DOT commissioner Janette Sadik-Khan, among other things. I admit in the new book's introduction that Bill de Blasio's administration is pretty lackluster relative to Bloomberg. Our current mayor is pretty indifferent to the city's built environment, focusing on affordable housing, rezoning areas like East New York and Far Rockaway, and taking credit for the Bloomberg-initiated East Midtown rezoning, which will see the tallest-ever intentional demolition, at 270 Park Avenue. Needless to say, de Blasio's record on architecture and planning is jumbled, lacking the focus of Bloomberg, who transformed New York into a city-sized playground for the global rich. One thing de Blasio did was reduce the price of the ferries started by Bloomberg and expand the routes up and down the East River; in turn, I created a tour that starts it Manhattan and then moves to Queens and Roosevelt Island. Accompanying my tours are photographs by Pavel Bendov, whose New Architecture New York was published by Prestel in 2017. He provided some photos from that book and took new ones for mine; they made the process a lot easier (obtaining photos isn't fun!) and the book great to look at. 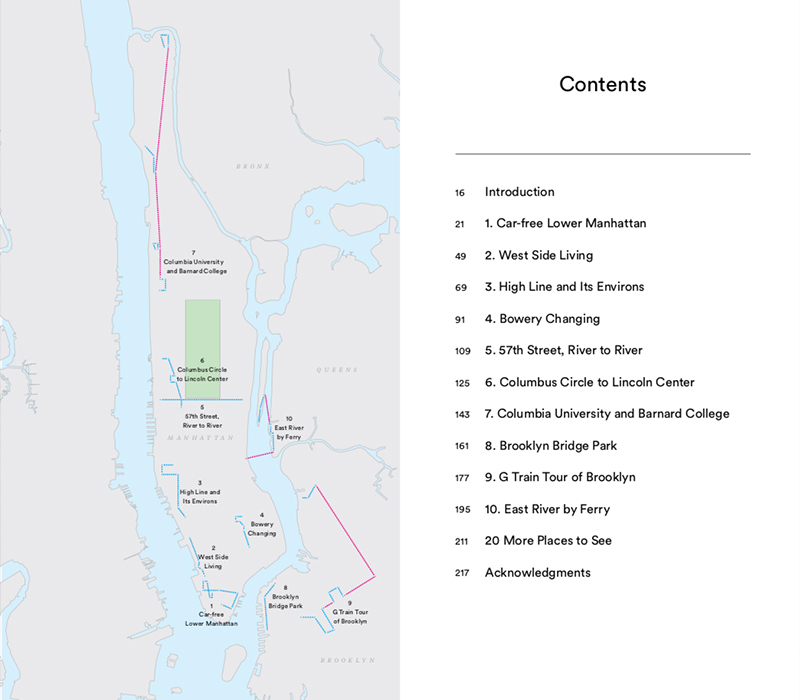 NYC Walks also has maps produced by AHL&CO, who handled the design of the book. The spreads below should convey the qualities of this, my fifth book, and make you want to buy it -- and go for a walk! John Hill is editor-in-chief of international e-magazine World-Architects.com and founder of the blog A Daily Dose of Architecture. He is the author of 100 Years, 100 Buildings and 100 Years, 100 Landscape Designs (both by Prestel). He lives in New York City.